A new wave of violent demonstrations occurred last week in the oil-rich province of Basra in southern Iraq as the mounting pressure of economic and social grievances reached a boiling point. At the heart of the crisis is a set of complex issues revolving around the various political crises which have plagued the Iraqi government since the start of 2018. The demonstrations were initially sparked about a week ago by electricity shortages in Basra. Iran’s decision to decrease the supply of electricity to the area was an attempt to put pressure on the Iraqi government for payments as a result of the US sanctions against Tehran (Arab News, July 17, 2018). Following the July 8th killing of a demonstrator in Basra by security forces, the demonstrations quickly intensified and spread to other areas in Iraq’s south — including Nasiryah, Maysan, Qadisiyyah, Kerbala, Thi Qar, Babil, Najaf, and even parts of Baghdad (as seen in the map below). In most of the affected cities, demonstrations have turned into sit-ins outside of government buildings and major oil fields. In Basra specifically, many protesters have organized sit-ins next to the border with Iran, focusing at least some of their anger towards Tehran (Al-Monitor, July 16, 2018). Following the storming of government buildings in Basra, Najaf, Karbala, and other southern cities, PM Haider al-Abadi sent Special Forces to Basra, and announced a state of emergency on July 15 (Kurdistan 24, July 15, 2018). Central to the demonstrations is the location and characteristics of Basra itself. The province contains 70 percent of Iraq’s proven oil reserves, yet suffers from rising poverty, crippling youth unemployment, and a crumbling infrastructure (The Independent, July 16, 2018). 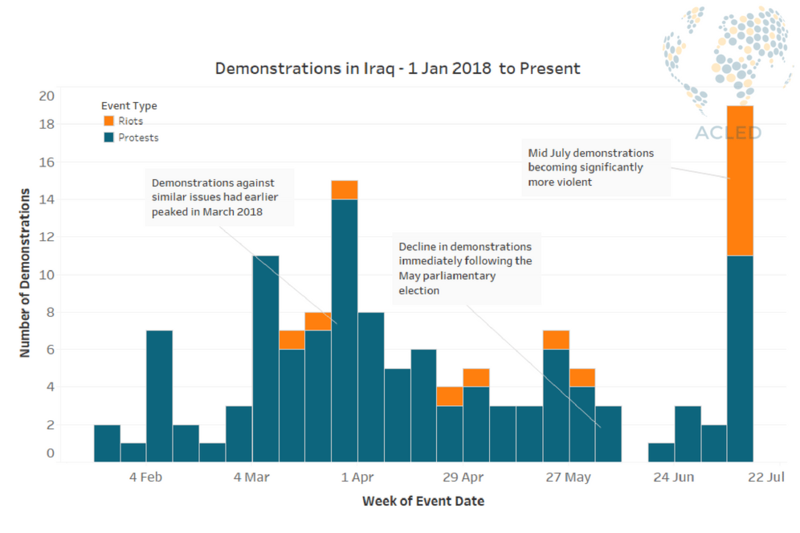 The situation was further exacerbated by the government’s delay in addressing the demonstrators’ demands, as Iraqis have protested these same issues since the start of 2018, following the end of the Haweejah offensive 2017 (see graph below; for more on this, see this past ACLED piece). Allegations of fraud and corruption, which the May 2018 parliamentary elections had been plagued with, further deepened Iraqi mistrust in the electoral process. This was evidenced by the lowest voter turnout since the country became a democracy fifteen years ago (Wall Street Journal, May 19, 2018). The delay in the formation of a new government has only added to this mistrust, as the final results of the May 12 elections have yet to be approved by the federal court and the winning coalitions have so far not been able to bring together the required majority to form a new government. The last parliament’s term ended on June 31, 2018, though as of yet the new parliament has not been formed (Al-Monitor, July 16, 2018). This has effectively left citizens with no coherent government to deal with or address their concerns. There also exists a strong history of power struggles between tribal groups and the state in Iraq. As a case in point, the emergence of a protester coalition on July 16 who call themselves the “Coordination Board for Peaceful Protests and Demonstrations in Basra” are made up of local tribesmen and activists (Rudaw, July 16, 2018). This board recently held a press conference in Basra, laying out 14 demands encompassing those made throughout the demonstrations — further complicating matters for the government who must now engage with and appease an organized local body representing the people. The ongoing war with the Islamic State has also exacerbated the situation by putting the Iraqi government under further economic pressure, making the fulfillment of demonstrators’ demands quite difficult. This crisis does not merely represent an eruption of Iraqi anger at the state of services; rather, it represents a deeper crisis stemming from the government’s inability to address the demands of its populace and to establish legitimacy. In attempts to resolve the crisis, PM al-Abadi headed to Basra himself on July 13 to meet with demonstrators and made several promises to provide jobs, electricity, clean water and other services to the city, while also releasing funds for these matters to the local government (Al-Monitor, July 16, 2018). However, continued efforts will need to be made to address the root causes of this crisis. 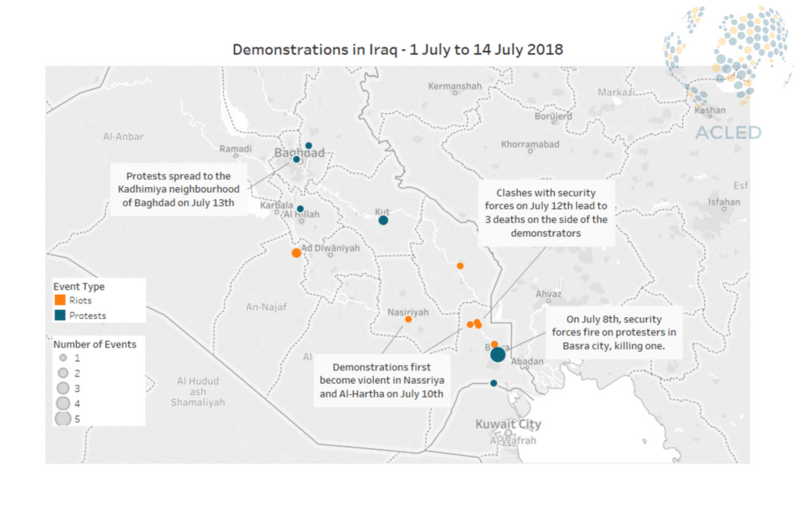 As two more protesters were killed by security forces in Samawah on July 15th, the situation seems to be growing more dangerous for the current central government, and the position of PM al-Abadi in it, as the root of the protests remains unresolved. Salma Eissa is a Middle East Researcher with ACLED and works on the Iraq project. Ms. Salma has an M.A. in Near and Middle Eastern Studies from the School of Oriental and African Studies (SOAS), University of London, London. She has 8 years of experience in the Egyptian civil society and academia sectors, and has a keen interest in policy issues. She is fluent in Arabic and English, and is based in Cairo, Egypt. ← Who are the UAE-backed Forces Fighting on the Western Front in Yemen?